It’s a well-known sales trick: sell the hardware for cheap, but make your money on the consumables. This is why your office printer is very affordable, but each toner cartridge is surprisingly costly. This sales approach is used in many industries, including heavy machinery manufacturing. In the fall of 2016, Thor3D’s distribution partner “Terem” was asked by their client (a large, professional bakery) to help them find a way to decrease their consumable costs. They operated several, professional-grade dough mixers in which the screw (the spiral part that mixes the dough) would get worn out every few months and would need replacement. These spare parts had to be shipped from Canada, which took a while and was quite expensive. The first alternative that Terem offered was to hire a graphic designer, recreate (i.e. draw) the shape of the screw in a 3D software program. When all was said and done, the result that was made by using that drawing was disappointing. To the naked eye it looked just like the original, but the screw was not balanced properly and if allowed to operate would break the whole mixer in minutes. The second approach worked better. 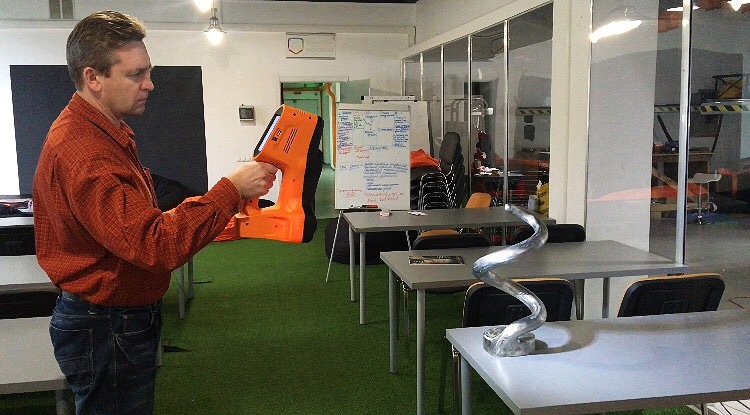 Terem used the Thor3D scanner to scan the original contraption and to create a perfect replica on a BigRep ONE 3D printer. According to Director of Business Development at “Terem” Michael Rihirev, the Thor3D scanner was an ideal fit for this job. That is because the scanner is meant for scanning medium and large objects, so it has a large field of view. That means that this large object was scanned in a matter of seconds and with great accuracy. Once the 3D model was ready, it was printed. It was 65cm in height and 28cm in diameter. The supporting materials were easily deleted using a special liquid called LIMONENE. 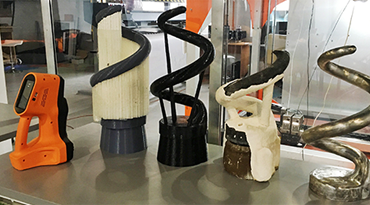 Afterwards, “Spetslit”, a company which was making the metal final product, doused the plastic screw (the one that was 3D printed) with ceramic composite and placed it in an oven where high temperature of 1000C degrees made all the plastic burn. So the result was the exact shape of the screw inside this ceramic composite mold which, as a final step in the process, was filled with stainless steel to create the final product. Each time the bakery ordered one of these parts from abroad, it would cost them $1,500. With 3D scanning/3D printing helping them reverse engineer and manufacture these parts in their own city, each part will now cost them $650. Almost a 60% savings!